Hello World, For starters, I feel honored that I am able to be a part of the "Diary of a Baller" series, knowing the history of players that came before me. Secondly, I am very excited to give you an insight into my life, on and off the court. Well, I am Judah McIntyre, point guard for New Renaissance Basketball Association (RENS). Contrary to popular belief that I am 16 or 17 still in the 8th grade, I recently celebrated my 15th birthday three weeks ago. 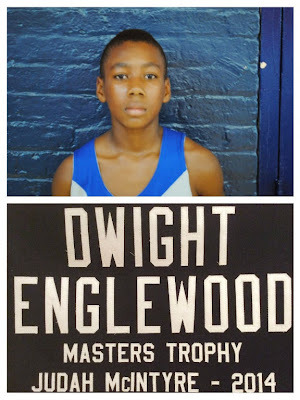 I attend Dwight-Englewood on an academic scholarship which I am very proud of. I was recently awarded the prestigious Masters Award from Dwight-Englewood. This award is usually give to a student who exemplifies excellence both in academics and sports. In addition, I am the first student to receive this award at the end of my 7th grade year in over thirty years at the school. This week was a pretty good week, despite the fact that my team lost to New Heights in the semi-finals of the Tip-Off Classic. I am still disappointed in my play throughout this weekend. This just simply means that I have to get back in the gym and work even harder to try and get better. Monday-Wednesday, were pretty light days for me basketball wise. Was only able to do my daily push-ups and sit-ups, because I had a lot of homework and studying to do. My main focus of study was on Spanish test that was on Wednesday - which I later got an A minus on. Wednesday night, I went to Christ the King for Rens practice and I saw one of my really good friends Tyrek Chambers. I was happy to see him because I haven't seen him in a while and we sort of caught up on a lot of things before my practice. Also, watch out for this kid, he just received offers from a couple of D1 schools. Watchout! Anyway, that night we had a good practice and worked on a couple things as a team to get ready for this weekend but we also did some drills individually, which I thought were great. Thursday morning, I woke up around 5:30 A.M. for a workout with my dad before school started. For the first half of the workout I mainly worked on my conditioning and strengthening my legs. After, I did some drills, working on my 3pt shooting and my pull-up jump shot. Once I was done, I was off to school. Since, I didn't have any regular classes on Friday's, I didn't really do much homework or studying. I enjoyed one of my hobbies, which is playing fantasy basketball with my dad. It's really fun and I really enjoy doing it with my dad because I feel it's a great bonding time. Also, I am able to analyze players in the NBA and really learn the game while trying to find players that I would like to pattern my game after. Friday was a great day, mainly because I raised my Spanish Grade to a B+ which was at a C earlier in the year. I went to youth Church that night in the Bronx. Going to Church, I think is really important because without God nothing is possible and he's the reason why I've grown to become who I am today. I was super excited for this weekend, playing in the first Basketball Spotlight tournament of the year. Our first game, I didn't play too well mainly because I felt I wasn't aggressive enough, but we still won. Our second game I felt I played much better, definitely more aggressive, shout out to my brother Cole, for catching his first dunk in the game. Later that day I was super excited to go to Sneaker Con. I love collecting, selling, trading, and buying sneakers. It is one of my favorite things to do. I also enjoy it because everything I buy or sell is with MY money that I've made. I bought two pairs of sneakers that I've wanted for a while. After, I hung out with a couple of my friends. I was able to get some rest for the games in the morning. That morning we faced North-East Finest and we beat them convincingly. I felt I had a pretty good game and I felt I was really leading my team. Sadly we took the L to New Heights, which I promise you won't happen again. I had a good game and I caught fire from 3 point range -which is something I've been working on for a while so I was proud of myself for that. In all, it was a great weekend and this is just the beginning of a long basketball journey and it's something my team will have to learn from. This is Judah McIntyre, signing off, and remember use basketball don't let it use you. See ya next week! Follow my life @j_macvip!